What are Library Research Databases? The library subscribes to over 300 research databases that allow you to access thousands of journal articles, ebooks, newspaper articles, video and more. Research databases are online resources but the content is only available to Flinders University staff and students when you sign in with your FAN and password. 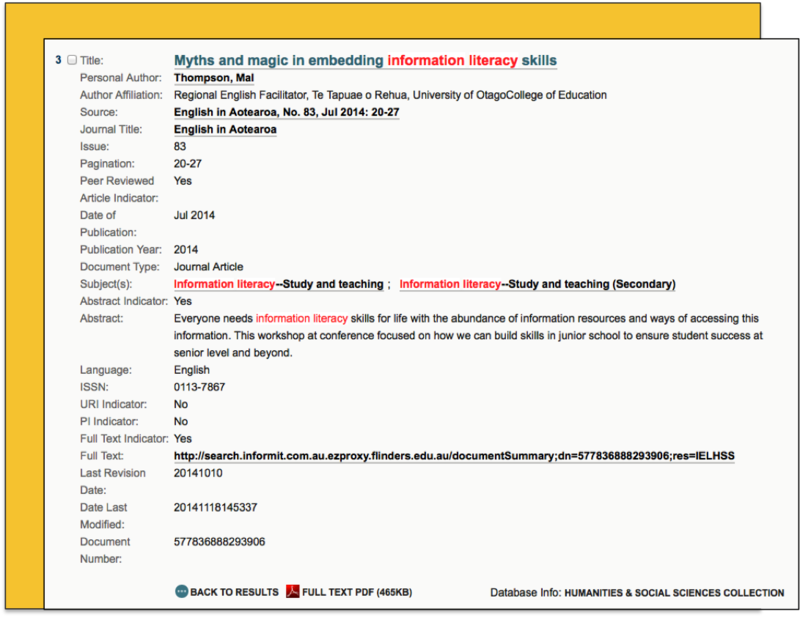 Many databases provide full text articles but some are only citations and you use the FindIt@Flinders links to access our subscription. Why do I need to use them? Library research databases are the key tool to accessing most of the academic resources available in print and electronic format. FindIt@Flinders is also a database. Most academic, peer reviewed, scholarly information is not freely available on the internet. You may discover an article through a Google search but when you try to use it you will be asked to pay to access. By using FindIt@Flinders and the library research databases you can access all this material that we subscribe to on your behalf. How do I know which one to use? The Find Databases link located on top right of the FindIt@Flinders search page provides an A-Z list of databases that also allows you to select databases by subject and by type. The Liaison Librarian recommend the best databases in a subject area in the the Search Smart Subject guides. They also create specific topic search smart guides to help you discover and access resources for a research project or activity. Search FindIt@Flinders, Limit by collection to find the best databases to use in that subject area. Ask a librarian or your subject specialist - supervisor, topic coordinator, tutor etc. what are the best databases in a particular research area. Many search strategies can be used to make library research database searching more efficient. Each database handles search strategies such as boolean operators and truncation in different ways. All databases have excellent help pages and quick tips on how to apply a search.